ENERSOL SPRL (Belgium) was responsible for the technical and engineering part of the project, assistance on the installation on site and logistics from Belgium to Bujumbura. ETRAVE (Burundi) was responsible for logistics and administration in Burundi, the installation of devices and the construction of cabinets with technical support from ENERSOL. The challenge was to complete the project in six months, as transportation alone could take up to two months. Moreover, very specific products and large quantities of batteries, inverters and others LED bulbs had to be used. ENERSOL and ETRAVE set up the off-grid PV system and all electrification for each building, including installation of switches for each light and power plugs. Each of the 40 health centres was installed in one day (around 17 panels and 16 batteries, as well as around one km of cables, 50 LED bulbs with sockets, 20 power plugs for each centre). A 20 kWp PV system was also set up at Kynyinya Hospital in Burundi. The installations supply energy to conserve vaccines correctly and enable future mothers to give birth in acceptable health conditions. 680 solar panels, 680 batteries of 12 V 230 Ah and 150 inverters were installed, and 100 metal cabinets were constructed to minimise the risk of burglary or destruction. 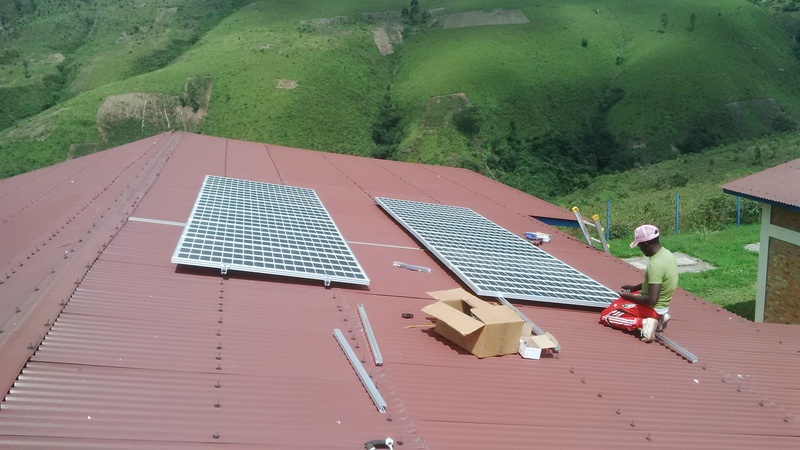 A second installation for a single hospital was realised in Kynyinya, Burundi, and consists of a 20 kWp PV system, 4000 ah-48 volts gel batteries and three phases system with three PV inverters of 6 kWp. In each health centre, ENERSOL trained a local technician during the installation to maintain the plant. All the installations were made by two crews of eight people, two Belgian technicians, six Burundian and Rwandan technicians. ENERSOL’s local partner agreed to take care of annual maintenance for three years. All the work was done in two months on site, and lasted around six months from the signature to the reception. The cost of the project was around 1,300,000 EUR and was financed by the European Union (10th European Development Fund). The project was a part of the policy of improvement for health centres in remote areas, including preservation of vaccines, light during night time, electricity for medical material, increase sanitary conditions, etc.) It is estimated that the project has helped around 30,000 people at minimum. All the installations were successful and were received properly by the community. At the Kinyinya Hospital, ENERSOL succeeded in convincing the beneficiary to make a mini-grid system and a more powerful PV system for the hospital. The hospital therefore now has the possibility to provide bigger peak energy in the aim to have bigger medical installation. This solution permits to increase the installation of 20% PV power (as its 250 Wp panels 60 cells, less expensive) and gives a sustainable solution with better lifetime batteries (1,200 cycles against 800 cycles) for the same total capacity.